I think we’ve figured this out now to make it usable for those who stumble accross this blog. I started out posting all of our past newsletter in what I believe is now the wrong section so I have done some reorganizing and will get the archived newsletters onto the new newsletter tab and keep this section for actual news from the farm. Keep checking as we’ll be attempting to post and update at least bi-weekly. Spring has finally and definitively arrived here. It has been a couple of weeks now since we had a night frost, it seems, and the snow is at last gone from all but the shadiest places. The chickadees (black capped’s and boreal’s) and juncos (slate-coloured and Oregon’s) at the feeder have been replaced by white crowned sparrows, while the yard and the woods are filled with sapsuckers and flickers, barn and tree swallows, the swamp with winnowing snipe and quacking hordes of wood frogs. We are pretty much right on schedule with our started plants in the greenhouse, although certainly the direct field seeding has been delayed some by the late thaw. It is now windier than this country normally is, (according to neighbors,) more like the plains we just left. We are hoping this is something short-lived. We have enjoyed the sense of calm that has prevailed here until the past week or so. The last weekend of April we took a minor part in the “Local 101 and 102” events put on by Slow Food at the Palace Theatre and the University of Calgary. This event was focused on local food production. Driving in, we reflected on the teeming hive of activity Calgary has become, and felt excited that the city was hosting an event focused on such an important issue as put on by such an esteemed organization. We had fun, there were some great presentations and films. The attendance, however, was frankly appalling for the entire weekend, with this fact being the dominating factor in pretty much everyone’s analysis of the event. We are hoping this was due to a lack of advertising exposure – which we have heard was not what it could nor should have been – and not an honest reflection of the relative order of priorities in our city. (Perhaps next year the event can be slid out onto the ice during the intermissions in a Flames game, some wag suggested.) This may well be the case – certainly the CSA model is receiving plenty of support from Calgarians these days, with the number of startup CSA’s on the rise, and this is a very positive sign. Our first flats of brassicas (broccoli, kale and cabbage,) have gone out into the house-garden field as of yesterday. This field was the produce source for the original Norwegian family who arrived here from Minnesota by ox and wagon. (What a trip that must have been!) They knew where to put a garden in a climate like ours – and theirs – it is a lovely little micro-climate they chose, noticeably warmer on a cool windy weekend like we just had. We are deeply grateful to members Jo-Anne and Ashley Gibson, Bev Hollenbeck and Shelina Knight for coming out and participating in the planting. These folks were efficient! In a matter of a few short hours, they came, they conquered and they left, like a small locust plague in reverse, leaving the beginnings of a crop where just hours before there had been barren dirt, and turning for us what would have been an all-day task into something easily manageable in an afternoon. Similar events occurred here earlier in the past month, including the crucial help we received in erecting a new passive-solar greenhouse (for peppers and tomatoes) and in surveying our north fenceline thanks to dear friends Boris Berthelot and friend Paul, and Corinne and Gary Funk, respectively. Many hands do indeed make light work, not to mention a priceless sense of community! There is a raven with a nest in the nearby woods who is stealing our eggs. I had seen him coming and going from the area of the hen-house with pale objects in his beak that looked too small to be eggs, but this was a reflection of his considerable size. Eggs they were. In the old days, a firearm would have been produced, and a raven would have died, but that thought is appalling to us, where ravens are involved. Watching this raven dip and soar in the wind, like some gorgeous airborne dolphin – with an intellect on par – we can only come to the conclusion that ending such a fine, unfettered life for the sake of our own ones, (which may well be of inferior quality,) would be a terrible sacrilege. So the problem is one of husbandry, and hopefully it is one that can indeed be solved. Our dogs chase him when they see him, but his patrols are relentless. He is the master at this game. Predator issues were one of many factors bringing inefficiencies that lead to the (temporary) solution of modern agriculture – keeping everything under lock and key at great expense that could only be compensated for by increasing scale which in turn required ever more massive energy inputs. Of course, we know what this does to food quality, not to mention the quality of life for the creatures involved (including the farmer’s.) Sometimes problem predators do have to be killed, but this is not something that should be done without careful analysis. As a culture, we congratulate ourselves today that we no longer kill the hawk (a basic, reptilian creature compared to a raven,) that raids the henhouse like the small farmers of yore, without recognizing the inherent stack of ironies involved. It was precisely the shift to an industrial scale and mode of life that bought us the luxury in recent decades not to have to deal sometimes harshly with competing predators on the farms, and what’s more, that provided a living in our modern times for the scores of biologists and conservationists that champion such creatures (only a fraction the number of whom were provided for by the old system of patronage) so that they could in turn speak out against the nature and actions of the very industrial system that enabled most of their livelihoods. Thanks in large part to such folks, it is now a criminal act to protect your poultry by eliminating a problem goshawk, for instance. It is a complicated, convoluted time we live in. For is it not better to have many more small farms free-ranging their hens and necessarily killing the odd goshawk, however magnificent, than to have a system that saves some hawks and creates a profession of being a naturalist on the one hand while endangering all of life on earth – hawks and humans included – with the other? We hope you all have a wonderful May, and that you’re able to get out there and enjoy our splendid part of the world! Today’s industrial agriculture… will become utterly unsustainable once the huge fossil fuel inputs that go into farm machinery, agricultural chemicals, worldwide transport networks, and the like stop being commercially viable. Converting back to horse-powered agriculture would be a challenge, but one well within the realm of the possible; relatively simple changes in agricultural, taxation, and land use policy could do much to foster that conversion. As I believe we’ve relayed by now, we are in the throes of moving to a new location, on the eastern periphery of the loosely defined settlement of Bergen. The move itself has been protracted by the freakish spring. Certainly we have never seen an April 3 that looked like this one for volume of snow – ever! The reasons for the move are various. We have adequate space here to be far more farm-sufficient than on the other place. Grow our own feed and all, which gives us a highly level of control over quality at a fraction of the cost. The land will undoubtedly be inferior in its initial state to the rich prairie soil we are leaving, and the growing season shorter, but these are problems we know how to address in a healthy and lasting fashion. In the meantime, there are attributes of the area that are vastly superior. There will be more moisture. More importantly, there is community here. We wish of course to be a vital part of both our local and extended communities. For this to work, there must actually be a community to be part of. Unfortunately, prairie Alberta has become not just an agricultural, but also a social wasteland at this point in its history of attrition. (And its history has been overwhelmingly one of attrition, which will be complete as energy reserves tighten. Without all the cheap oil of the past century, I am sure our plains would be more a wilderness akin to Mongolia.) I suppose agricultural wastelands are bound to also be social wastelands – the two things going hand-in-hand has certainly been the norm for most rural areas. The plains, being an area only marginally suited to human settlement, are simply at the worst end of the spectrum. They are now dominated by corporate farmers and Hutterites, two immensely destructive groups due to their preferred modus operandi whom, no matter how large they are, dream of being yet larger. Here in this particular section of the foothills of Alberta, things have remained on a more human scale. In fact, it is not an exaggeration to say that the feeling here, a mere hour and some due west of the former location and equidistant from Calgary, is one of living in an entirely different country peopled by an entirely different, and on the whole much healthier, race of beings. We have met a number of neighbors (there are many more of them here,) and the level of initial interest and acceptance for what we do has been universal. So far so good! Don and Jon arrive in Bergen. Whatever the challenges the new location brings, we have the overwhelming sense that we can make a better go of it here, and ultimately provide a broader range of the healthiest food the area can naturally produce. As for the season at hand, things (as none of us can avoid noticing!) seem to be off to a slow start following one of the nastiest winters in memory. Last year we were in the fields with the horses preparing ground by now, this year the ground yet lies under a thick blanket of snow, which at this point is bound to go fast and create some issues not just for us, but for pretty much everyone, we’d hazard to guess. Whether or not the commencement of the CSA season will be delayed remains to be seen, however. Last year we all thought we were way ahead of the game, yet ended up at least a month behind. So hopefully this year the reverse will be true! We’d like to thank everyone up front for joining this year, whether veteran or new members. In keeping with the spirit of the CSA model, we like to think we are offering more than just a healthier way to augment your diet in season. We hope our efforts (and by “our” efforts we mean the joint partnership between us here on the farm and you who are supporting us,) represent the fledgling days of a more hopeful way of life for ourselves and future generations. By growing poison-free food appropriate to place, being involved in local community, and keeping centuries-proven and truly sustainable traditions such as draft-horse powered farming alive, we hope that even if we get warshed out by a tsunami this year, you will still go away feeling that your money has been well placed, and that the returns on your investment will go beyond our particular farm and the given season at hand. This is our hope and it is what we are striving to provide through our efforts. It is, of course, a challenging work in progress for all of us, regardless of whether we work the land directly or from downtown Calgary. Well, it’s all aboard and full-steam ahead from here! Humans spent thousands of years living in small groups, hunting and gathering. The group was small enough so that each person knew every other person. Democracy could work because both the “voters” and the “politicians” were visible. It has only been in a tiny fraction of the life span of humanity that political units have been created that are far too large for people to know one another except as abstractions. Small groups have their problems, but in terms of providing happiness for the average person, the band or village is more efficient than the empire. Hope you’re all wintering well. Seems like a hard one, so far. Lots of below normal temperatures and not much sun, eh? We lost our young yak bull Enos, but we were expecting this: he was born deficient, in the lungs we believe. He is feeding the magpies, and hopefully the ravens and coyotes will get some of him, too. The dairy cows are doing well – Mary is milking still, and Prickle is due to give birth next month. Andrea has been making cheese: cottage, cheddar, mozzarella type, other types, cream. We’ve all had our hand at making butter and I make lots of yogurt. It’s all turning out very well, delicious. The horses are very tough, of course, and take the winter well – they look glorious in their fuzzy winter coats coming through the snow. The big news is we’re moving the farm! We’re headed for a place equidistant to this one from Calgary, but to the west, outside Bergen. Here we will have better facilities, amenities, and more space to do what we do. 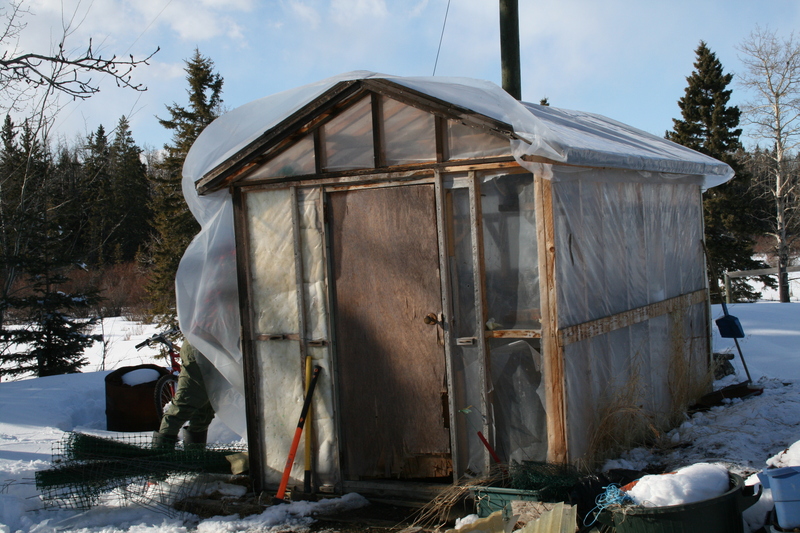 We’re headed out there end of February so we can get into gear for the summer 2011 CSA season. We’re excited about this move and the changes it represents and looking forward to continuing to provide for folks in Calgary. We had a great year last year and would like to thank you all again. I went back to see the a man about a cow – same man, same cow. The man, John, an elderly Hutterite, no longer on the colony. (I had originally been told by another that he was a Mennonite, but this is apparently incorrect.) The cow – Prickle – was back with him, visiting a boyfriend. But first, I phoned. “I’m doing my exercises… heh-heh-heh,” she said. “We don’t have a bull,” she said. “You have a borrowed one there, a Jersey,” I said. “Who do you think you’re talking to?” she asked. Well, now Prickle is back, hopefully pregnant. She now has a friend, Mary Poppins, a Jersey as light coloured as Prickle is dark for the breed, and also much lighter in demeanor. (Turns out John had this second cow for sale.) Mary Poppins, and I’m not sure which one of our friends named her, is in milk, and can be milked without fuss pretty much anywhere she is standing, which is the opposite of Prickle, who requires an elaborate setup of ropes and pulleys to get anywhere near a teat. We have made yogurt, butter, and of course just drank her milk. It is yummy, and the beaurocrats from Alberta Agriculture would be amazed – we are still alive!!! Fall is a time for migrating birds. The big, handsome Rough-legged hawks are here from the arctic now, a sure sign that the seasons are turning. There are other northern hawks about, too. The other day I was walking down the paddock and there was a goshawk down and just beginning to eat one of our chickens. This goshawk was what the falconers call a “passage bird,” a young one from this spring, now full grown of course, on its first fall migration. Goshawks are a forest hawk, but they come around on the plains in fall and winter. Fortunately, they mostly do pass. The odd predated chicken is the price you pay for free range eggs. Speaking of chickens, we have a number of young up-and-coming Ameraucanas (blue egg layers) to augment the flock, and new hen-houses are being built. We endeavor to keep expanding the flock, and the Ameraucanas – a heritage breed – are our favorites – hardy, multi-hued, and dependable. The CSA season ended with some heavier frosts. The gardens were dwindling, of course, as once the photoperiod enters its October phase, there isn’t so much growth going on anyway. The time seems fleeting, looking back. We had a wonderful season and really enjoyed our members. So now we’ve just finished the fall plowing with the Clydesdales, doing up some new garden plots as well as attending to the old ones. It is a challenge in our heavy soils, and even more so when breaking new ground. The sod on the plains is second to none in toughness, and what might take two or three horses in the east on a two-horse plow takes four to six here. We do it with a one-horse plow with three horses pulling it. Spreading manure with two horses on our old red spreader, then plowing with three. And then in the spring, the compost will go on. I really love these days working the horses. There is bound to be some big frustrations here and there, but the rewards outweigh this by far, and the big girls, while relatively young and pretty spirited, behave well, and catch on to their various jobs quickly. I trust them, and I think they mostly trust me at this point. Doncaster and Petunia did a good job starting these new garden plots – a scheme we embarked on to help make lighter work of the heavy sod. They have become large swine, and now are joined by Celesta and Janey, two younger female pigs, or “gilts” as the females are called at this stage. They will produce litters for us in the future for farm-raised pork. We have two young German helpers here right now, young fellas. They may be staying a month or more. Sven is taller, and more reserved, Manuel is always singing little songs. “My life is a musical!” Manuel exclaims. “I hate his musical,” Sven confides. Sven rolls his eyes. Never a dull moment. They are both great guys, and we are happy to have them here. We are very impressed with Germans, overall. It doesn’t surprise me that they make good stuff, back in their homeland, or when they come here for that matter. Other than the fact that they make a lot of good stuff, they of all the Europeans remind me of Canadians. Perhaps that’s why we get along with most of them so seamlessly. I’m not sure why they remind me of Canadians. Maybe another person would think they were like some other nationality. There are other nationalities to choose from, I suppose, when you’re comparing Germans. At any rate, I have to admit, I suppose, that I have no idea what other people think Germans are comparable to, but to us, they are impressive folks. We always feel a bit sad when the season ends, this year being no exception. We also feel very fortunate indeed to have had such a great CSA membership this year, folks who not only seem to share a sense of what’s important with us, but who are willing to make a commitment through a full season, come what may, to support us in this venture. We hope you found the experience to your liking, and it would be great to see you back next year. Whilst watering the garden the other day, a peaceful and protracted process that leaves lots of room for contemplation, I looked down at a kale bed and suddenly felt I was in a light plane over the African Veldt. The kale were like little acacia trees over the tawny scrub. Friedrich from that part of Germany bordering Poland, came back to help us again for a couple of weeks, joining Maarten, a great helper from Dutch Belgium who really enjoyed learning to be around big horses. Friedrich started a year long Canada and Alaska odyssey here on our little patch last October, and he chose to end it here this August. He is a fine specimen of a young man, in body and soul. In reflecting on his trip, he related as to how he felt the best he may have ever felt when he found himself amongst the abundance of wild animals in the far north. I found this reflection especially interesting, as I have experienced versions of this myself. More, I have long held the suspicion that this is a deep seated survival instinct from our beginnings, a state of being from which anthropologists say we have not yet had time to really deviate in any significant way involving our deepest programming. And so it yet remains that in some ancestral way, you know without thinking that you are in “good country” (as Hemingway would put it) when surrounded by clean water, healthy soil, and an abundance of game. I hope Friedrich can find this for himself again. (Hell, I hope we can all find this again!) We will miss him, and Maarten both. We have had our eye on a certain Clydesdale stallion – Jason – as a potential father to future horses here. We are very impressed with this stallion. Not only is he very well put together, he is the first roan stallion we’ve seen. Clydesdale breeders rarely keep roan stallions (although roan mares are common.) The trend, as with most everything in our culture these days it seems, has been toward uniformity – black or brown horses with four white feet. But the Clyde is a colourful horse, and this is the true expression of the breed. In fact, most of the best Clydesdales are roans. Jason’s current owner, a longtime “Clyde man” who inherited a working love for this breed from his father, believes that the genes that express all the best Clydesdale traits are actually linked to the roan patterns. Hence, it is not easy to find a really good bay coloured Clydesdale (think Budweiser), and even more difficult to find a really good black one. There are lots of both colours in Alberta, and many of them are decidedly not great Clydesdales. But for many here, if the colour is right, the horse is right. Well, it turns out we’re not the only ones with eyes for Jason. He has been sold to a new owner in South Africa, and scheduled to depart towards the end of September. This got us motivated to hustle two of our mares out there for breeding this month. Not the best time of year to breed, but probably our last chance at this stallion. ii) if we can do this with impunity, why shouldn’t the Brazilians? Someone should ask that of the CBC. After-all, maybe the CBC has never been to the environs of Zealandia, Saskatchewan. Not with open eyes, anyway. Ah well, it’s all good, as they say. A lot. Where’s my sandwich? Back here on Small Farm earth, one of the great things about having domestic ducks is that the wild ones that are on the ponds are tamer. They seem to take some cue from the farm fowl, and get used to us doing our rounds. We currently have a flock of young Gadwalls – a subtly marked, yet very handsome duck – that zoom off the pond right over our heads to do a circuit of the property and zoom back in for a landing again, dipping and weaving with great competence. And young teal, blue-wings that do the same – fast and cunning little ducks the size of pigeons. The bad thing about having domestic ducks is trying to find their eggs. They don’t care that we want them, or maybe they do, and that’s why we can rarely seem to find them before the varmints get to them. Maybe next year we’ll outwit ducks. Good to set lofty goals. I am writing this newsletter ahead of time as I am sure you are wondering what is going on. Take heart. I am always wondering what is going on. Just when I think I have a pretty good idea, something else seems to be taking place. Now that we finally have some heat, it is likely deliveries will start in couple of weeks. I expect things will really get growing now. The sodden areas of the fields are becoming accessible again. The season seems at least three weeks behind. As for natural indicators, I was checking out some places where the bullsnakes, for instance, come to lay their eggs. Places I’ve been aware of for a dozen years or more. Every year around June 8 or so, the two-metre long shed skins of the females, many of them, appear on a certain bluff near certain holes preparatory to the deposition of eggs in self-dug burrows. On Sunday (the 20th) I checked this site out. For the first time in a dozen years of monitoring, there were no shed-skins to be seen, and only one snake found on the bluff, and this was already nearly two weeks late. We went to look at the cow. She was out back. On the way to her paddock our path was crossed by a lactating bloodhound. A good sign. The old man appeared not to notice the bloodhound, but I still took it as a good sign. Maybe it wasn’t even his bloodhound. There was the cow, standing there in front of us now. It was a Jersey, small as cows go, with dark face and legs. Very beautiful, very Jersey. An unequivocal Jersey. The a-priori Jersey, in fact. “What’s her name,” I asked. The cow had a ring through her nose, which I did not take as a good sign. I had never seen a cow with a nose ring. Only bulls. She was not handled much, the old man said. Skittish. But still giving milk almost a year since giving birth and only five years old and only two calves so far, one of which was still in her. All good signs. I managed to get a look at her milk veins and feel her bag. Big veins. A good sign. Soft bag –good. We bought the cow for nine hundred dollars and renamed her “Brown Swiss.” (Just kidding.) Most Jerseys go for twelve to fifteen hundred. She has settled in and we’ve milked her and she’s tried to kick me over the moon – the saved dollars. Now her hind leg is tied back when milking and she no longer tries to kick. We have made our first batch of yogurt from “Prickle’s” milk. It is very good – rich with blobs of butterfat in it. The life, for sure, when you’re eating that. Granting, of course, that according to our fearless leaders in government you are ingesting a “hazardous substance.” We plan on raising more milk cows. We need lots more milk like that, all of us. Prickle’s in calf to a Holstein, after which we will be breeding her to Jersey bulls. Her calf will probably be black. Hopefully the season will be drawn-out this fall. It will be a good one, regardless, once it starts.